The Data Entry Analyst is responsible for importing, transforming, modeling and validating data of the organization with a purpose to draw or infer or drive to a conclusion regarding the organization’s operational decision making. Job responsibilities also include converting figures to graphs, tables and to develop a database from the collected data. A Data Analyst develops analysis and reports capabilities; monitor performance lays quality control and identifies plans for improvement. 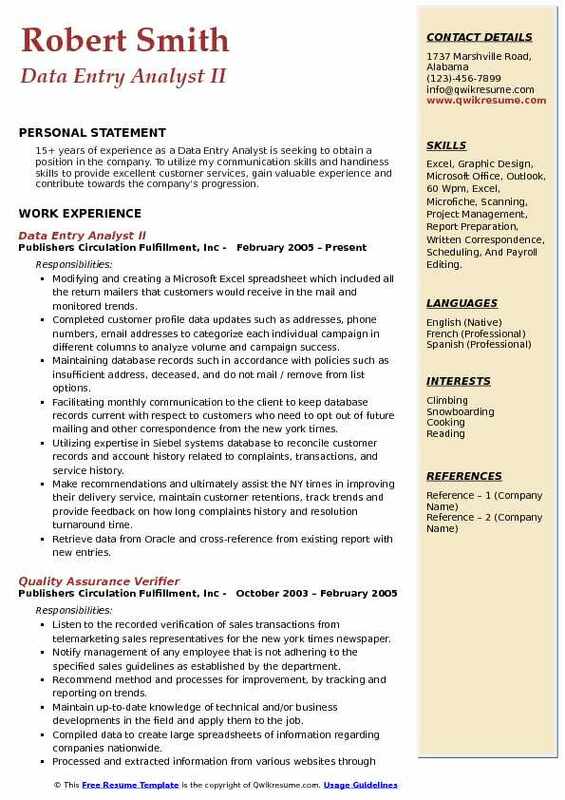 A well crafted Data Analyst job description template is sure to fall into the eyes of the hiring employer, normally a Data Entry Analyst Resume Sample which projects candidate with a Bachelors degree in Computer Science, Information Technology, Mathematics, Economics or statistics fits well for an entry level Data Entry Analyst. 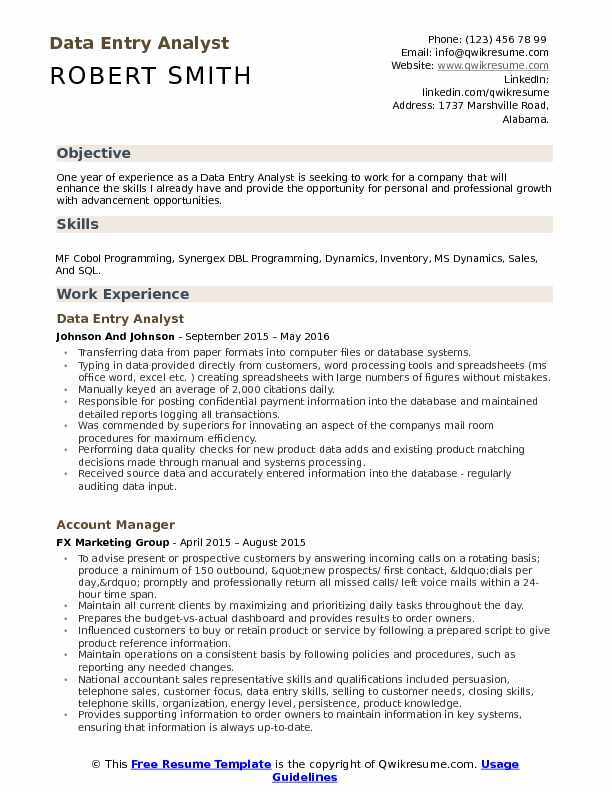 Objective : One year of experience as a Data Entry Analyst is seeking to work for a company that will enhance the skills I already have and provide the opportunity for personal and professional growth with advancement opportunities. Skills : MF Cobol Programming, Synergex DBL Programming, Dynamics, Inventory, MS Dynamics, Sales, And SQL. Transferring data from paper formats into computer files or database systems. Typing in data provided directly from customers, word processing tools and spreadsheets (ms office word, excel etc. ) creating spreadsheets with large numbers of figures without mistakes. Manually keyed an average of 2,000 citations daily. Responsible for posting confidential payment information into the database and maintained detailed reports logging all transactions. Was commended by superiors for innovating an aspect of the company's mail room procedures for maximum efficiency. Performing data quality checks for new product data adds and existing product matching decisions made through manual and systems processing. Received source data and accurately entered information into the database - regularly auditing data input. 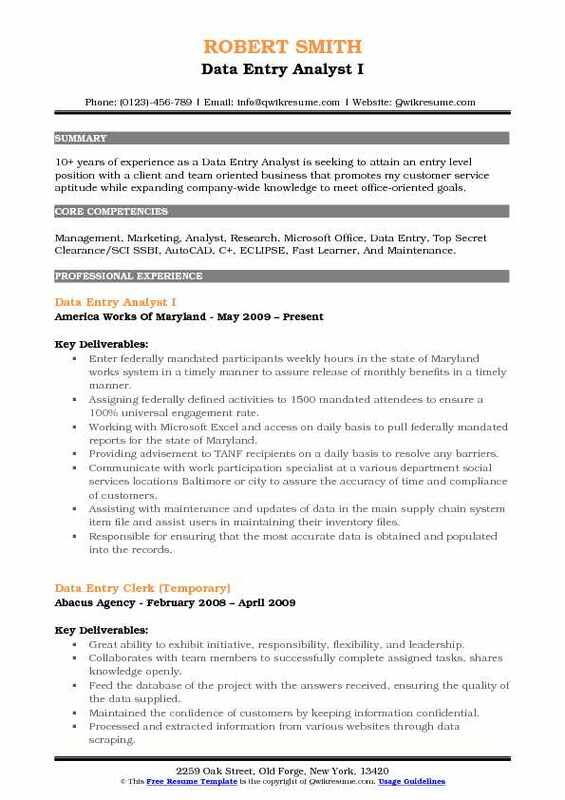 Objective : One year of experience as a Data Entry Analyst is now exploring opportunities to seek an assistant position utilizing my education, training, and experiences. 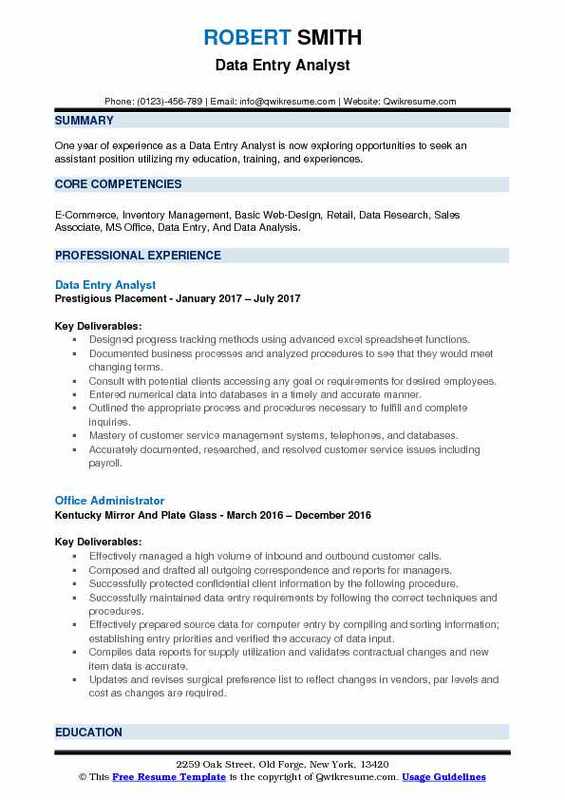 Skills : E-Commerce, Inventory Management, Basic Web-Design, Retail, Data Research, Sales Associate, MS Office, Data Entry, And Data Analysis. Designed progress tracking methods using advanced excel spreadsheet functions. Documented business processes and analyzed procedures to see that they would meet changing terms. Consult with potential clients accessing any goal or requirements for desired employees. Mastery of customer service management systems, telephones, and databases. Accurately documented, researched, and resolved customer service issues including payroll. Prepared various reports and presentations on the productivity and progress of the department. Headline : An experienced individual looking to contribute my 5 years of customer service to an excellent company where I can grow and expand internally. Prepare insurance claims for submission to third party payers and/or responsible parties. Review claims for accuracy, including proper diagnosis and procedure codes, to ensure timely payment. Review claim rejections and communicate effectively with payers to resolve billing issues. Use skills and knowledge to decrease the amount of unpaid and rejected insurance claims. Follow proper timely filing guidelines to decrease the amount of rejected claims. Provide customer service to patients and visitors around clinics and hospital where stationed. Prepare reports, spreadsheets, and documents to file all work completed. Reviewed the CRM database system and excel spreadsheets to improve efficiency and to implement better algorithms for further growth. 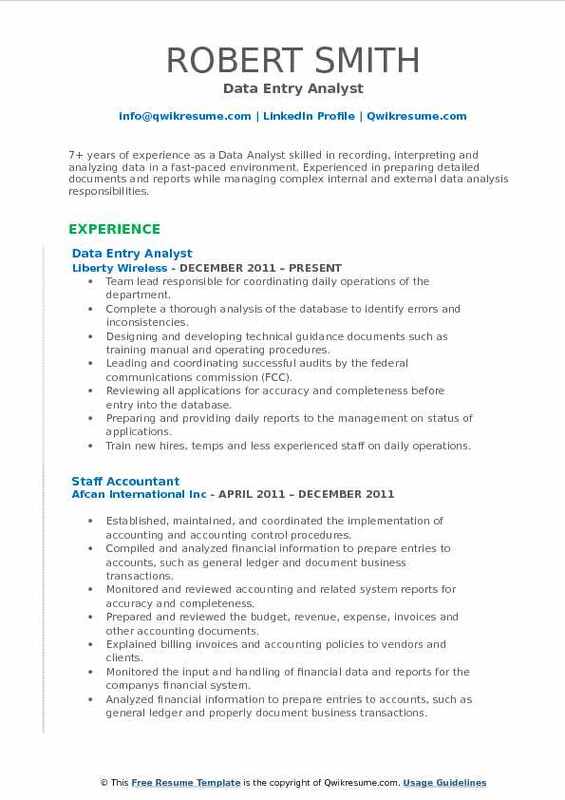 Summary : 7+ years of experience as a Data Analyst skilled in recording, interpreting and analyzing data in a fast-paced environment. Experienced in preparing detailed documents and reports while managing complex internal and external data analysis responsibilities. Skills : QuickBooks, Organizational Leadership, Strong Written And Communications, Client Relations, Management, Marketing, Analyst, Research, Microsoft Office, Data Entry, And Top Secret Clearance/SCI SSBI. Team lead responsible for coordinating daily operations of the department. Complete a thorough analysis of the database to identify errors and inconsistencies. Designing and developing technical guidance documents such as training manual and operating procedures. Leading and coordinating successful audits by the federal communications commission (FCC). Reviewing all applications for accuracy and completeness before entry into the database. Preparing and providing daily reports to the management on status of applications. Train new hires, temps and less experienced staff on daily operations. Objective : 2 years of experience as a Data Entry Analyst is seeking to become an asset to the employer by performing administrative-type support duties and to give 110% each day to learning, performing, and mastering the responsibilities of the job. 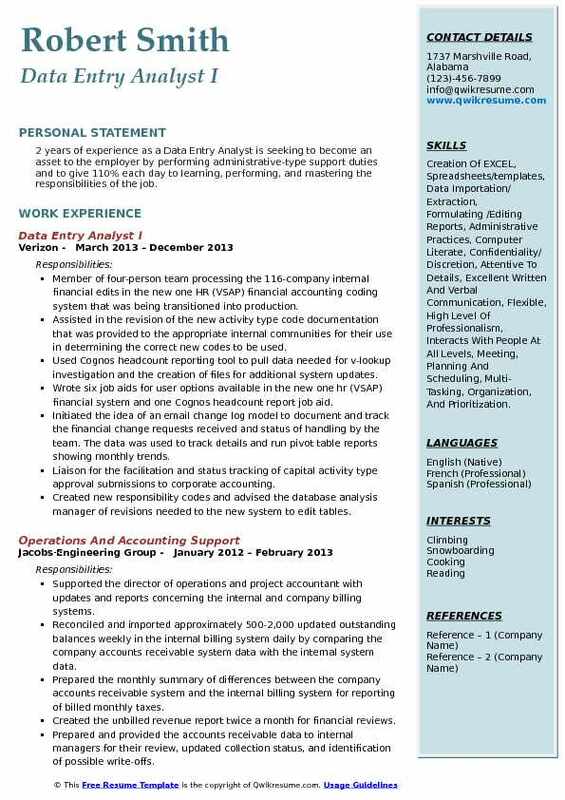 Skills : Creation Of EXCEL, Spreadsheets/templates, Data Importation/ Extraction, Formulating /Editing Reports, Administrative Practices, Computer Literate, Confidentiality/ Discretion, Attentive To Details, Excellent Written And Verbal Communication, Flexible, High Level Of Professionalism, Interacts With People At All Levels, Meeting, Planning And Scheduling, Multi-Tasking, Organization, And Prioritization. Member of four-person team processing the 116-company internal financial edits in the new one HR (VSAP) financial accounting coding system that was being transitioned into production. Assisted in the revision of the new activity type code documentation that was provided to the appropriate internal communities for their use in determining the correct new codes to be used. Used Cognos headcount reporting tool to pull data needed for v-lookup investigation and the creation of files for additional system updates. Wrote six job aids for user options available in the new one hr (VSAP) financial system and one Cognos headcount report job aid. Initiated the idea of an email change log model to document and track the financial change requests received and status of handling by the team. The data was used to track details and run pivot table reports showing monthly trends. Liaison for the facilitation and status tracking of capital activity type approval submissions to corporate accounting. Created new responsibility codes and advised the database analysis manager of revisions needed to the new system to edit tables. 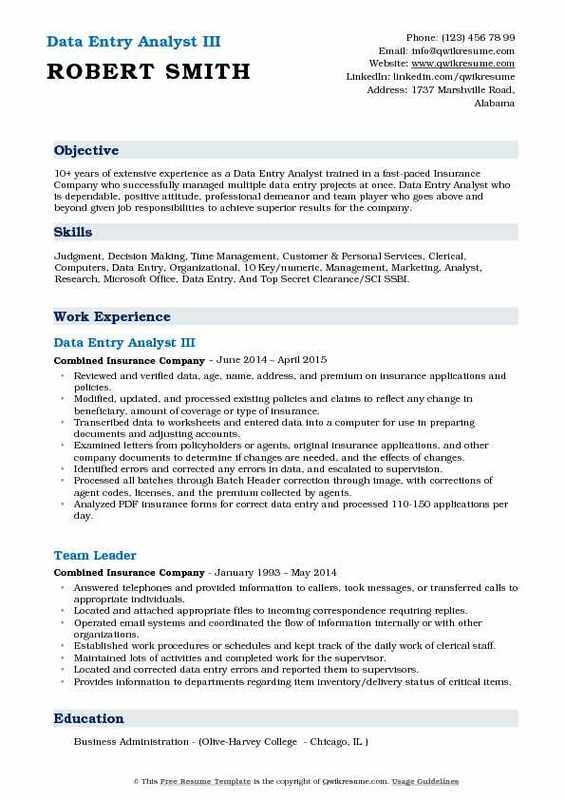 Summary : 10+ years of extensive experience as a Data Entry Analyst trained in a fast-paced Insurance Company who successfully managed multiple data entry projects at once. Data Entry Analyst who is dependable, positive attitude, professional demeanor and team player who goes above and beyond given job responsibilities to achieve superior results for the company. Skills : Judgment, Decision Making, Time Management, Customer & Personal Services, Clerical, Computers, Data Entry, Organizational, 10 Key/numeric, Management, Marketing, Analyst, Research, Microsoft Office, Data Entry, And Top Secret Clearance/SCI SSBI. Reviewed and verified data, age, name, address, and premium on insurance applications and policies. Modified, updated, and processed existing policies and claims to reflect any change in beneficiary, amount of coverage or type of insurance. Transcribed data to worksheets and entered data into a computer for use in preparing documents and adjusting accounts. Examined letters from policyholders or agents, original insurance applications, and other company documents to determine if changes are needed, and the effects of changes. Identified errors and corrected any errors in data, and escalated to supervision. Processed all batches through Batch Header correction through image, with corrections of agent codes, licenses, and the premium collected by agents. Analyzed PDF insurance forms for correct data entry and processed 110-150 applications per day. 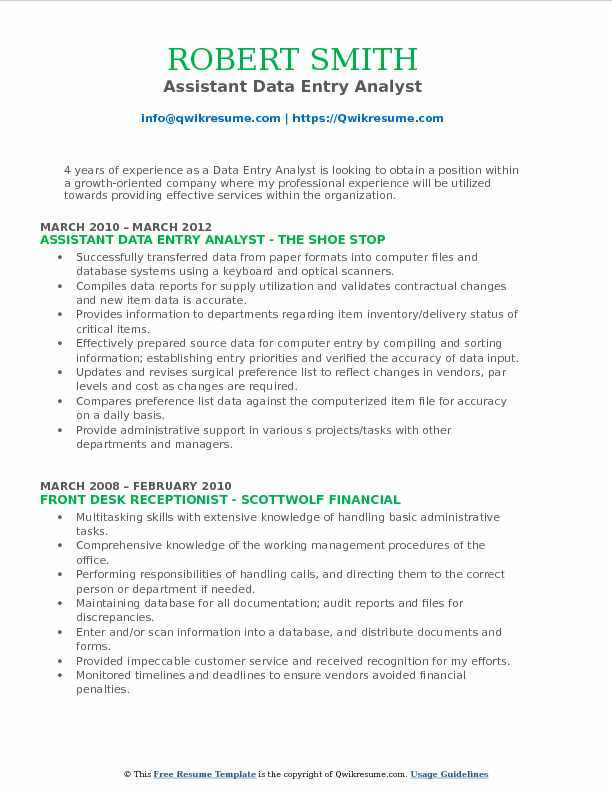 Objective : 4 years of experience as a Data Entry Analyst is looking to obtain a position within a growth-oriented company where my professional experience will be utilized towards providing effective services within the organization. Skills : Microsoft Programs, Excel, Word, PowerPoint, Photoshop, Publisher, Database Management, Internet Media And Social Marketing. Successfully transferred data from paper formats into computer files and database systems using a keyboard and optical scanners. Compiles data reports for supply utilization and validates contractual changes and new item data is accurate. Effectively prepared source data for computer entry by compiling and sorting information; establishing entry priorities and verified the accuracy of data input. Updates and revises surgical preference list to reflect changes in vendors, par levels and cost as changes are required. Provide administrative support in various s projects/tasks with other departments and managers. 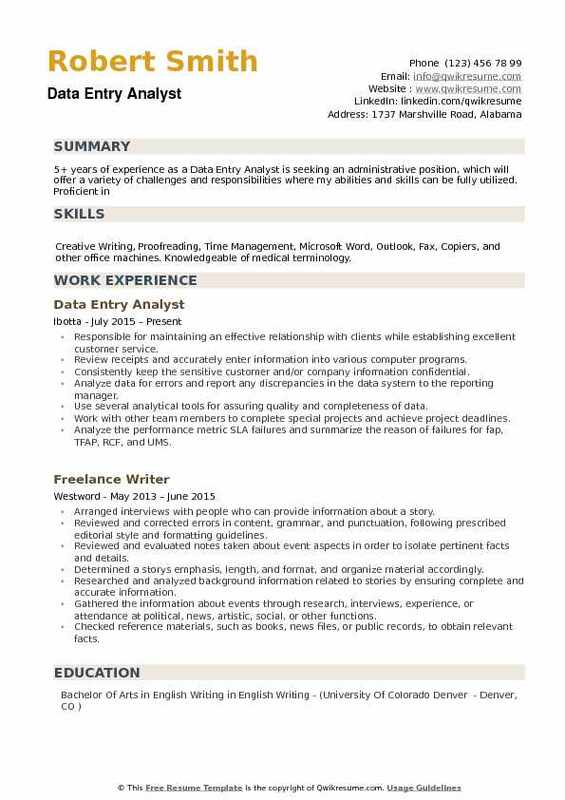 Summary : 10+ years of experience as a Data Entry Analyst is seeking to attain an entry level position with a client and team oriented business that promotes my customer service aptitude while expanding company-wide knowledge to meet office-oriented goals. Skills : Management, Marketing, Analyst, Research, Microsoft Office, Data Entry, Top Secret Clearance/SCI SSBI, AutoCAD, C+, ECLIPSE, Fast Learner, And Maintenance. Enter federally mandated participants weekly hours in the state of Maryland works system in a timely manner to assure release of monthly benefits in a timely manner. Assigning federally defined activities to 1500 mandated attendees to ensure a 100% universal engagement rate. Working with Microsoft Excel and access on daily basis to pull federally mandated reports for the state of Maryland. Providing advisement to TANF recipients on a daily basis to resolve any barriers. Communicate with work participation specialist at a various department social services locations Baltimore or city to assure the accuracy of time and compliance of customers. Assisting with maintenance and updates of data in the main supply chain system item file and assist users in maintaining their inventory files. Responsible for ensuring that the most accurate data is obtained and populated into the records. Summary : 15+ years of experience as a Data Entry Analyst is seeking to obtain a position in the company. To utilize my communication skills and handiness skills to provide excellent customer services, gain valuable experience and contribute towards the company's progression. 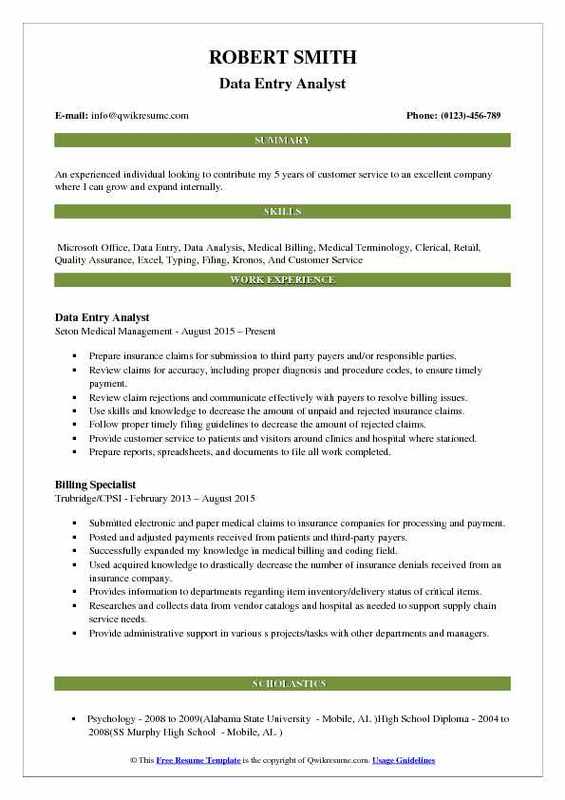 Skills : Excel, Graphic Design, Microsoft Office, Outlook, 60 Wpm, Excel, Microfiche, Scanning, Project Management, Report Preparation, Written Correspondence, Scheduling, And Payroll Editing. Modifying and creating a Microsoft Excel spreadsheet which included all the return mailers that customers would receive in the mail and monitored trends. Completed customer profile data updates such as addresses, phone numbers, email addresses to categorize each individual campaign in different columns to analyze volume and campaign success. Maintaining database records such in accordance with policies such as insufficient address, deceased, and do not mail / remove from list options. Facilitating monthly communication to the client to keep database records current with respect to customers who need to opt out of future mailing and other correspondence from the new york times. Utilizing expertise in Siebel systems database to reconcile customer records and account history related to complaints, transactions, and service history. Make recommendations and ultimately assist the NY times in improving their delivery service, maintain customer retentions, track trends and provide feedback on how long complaints history and resolution turnaround time. Retrieve data from Oracle and cross-reference from existing report with new entries. Skills : Creative Writing, Proofreading, Time Management, Microsoft Word, Outlook, Fax, Copiers, and other office machines. Knowledgeable of medical terminology. Responsible for maintaining an effective relationship with clients while establishing excellent customer service. Review receipts and accurately enter information into various computer programs. Consistently keep the sensitive customer and/or company information confidential. Analyze data for errors and report any discrepancies in the data system to the reporting manager. Use several analytical tools for assuring quality and completeness of data. Work with other team members to complete special projects and achieve project deadlines. Analyze the performance metric SLA failures and summarize the reason of failures for fap, TFAP, RCF, and UMS. Provide in depth, weekly reports to management on the status of the current and incoming records.